Crock pot roast beef is juicy, tender, and absolutely delicious! If you love pot roast, this is the easiest pot roast recipe you will ever make. Just add 5 simple ingredients to your slow cooker and power it on. Your dinner will be ready to eat just a few hours later. 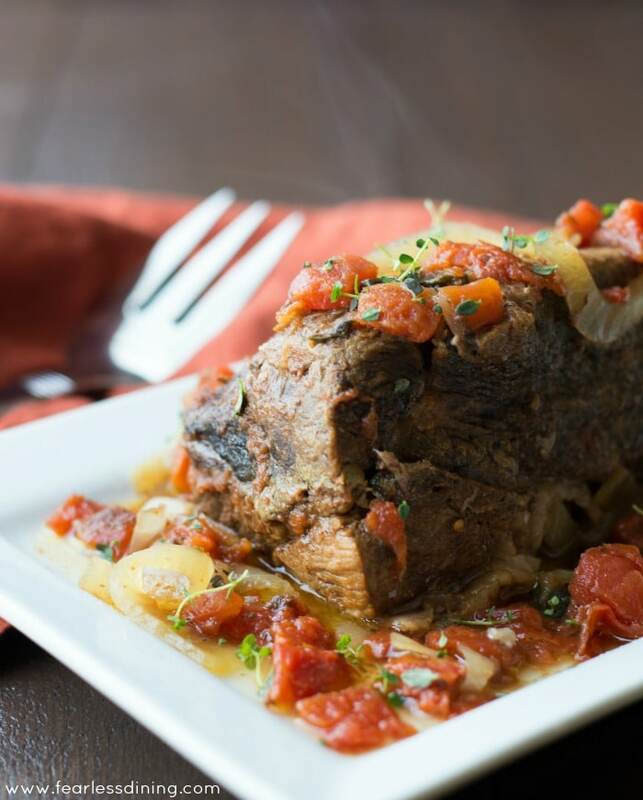 This pot roast slow cooker recipe is gluten free, paleo, and Whole30. and it’s the best slow cooker pot roast I’ve eaten. I am all about easy. 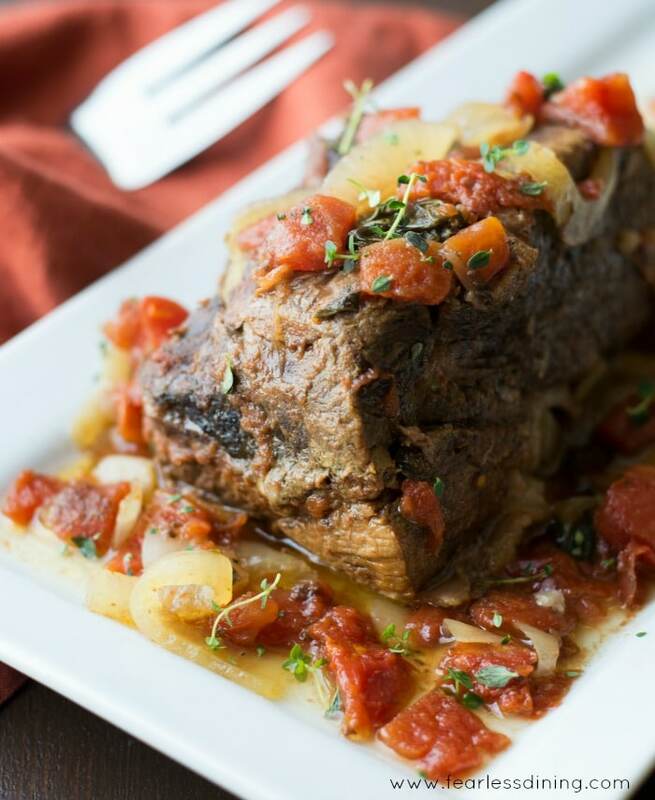 This crock pot roast recipe is paleo, and I dedicate it to all of the meat lovers in your family. This really is the best slow cooker pot roast recipe, because it just doesn’t get any easier. It is truly foolproof! Dump the ingredients into your slow cooker. DON’T brown the meat first. NEVER coat the meat in anything. DON’T do anything extra. This roast doesn’t need any special TLC to become great. These rules should help you make the best pot roast dinner :-). This slow cook roast is guaranteed to be an incredible dinner! If you love slow cooker recipes, try this Slow Cooker Pulled Pork or this Spicy Slow Cooker Pot Roast Tacos recipe. 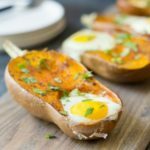 This recipe is whole30 compliant, paleo, dairy free, and full of protein! 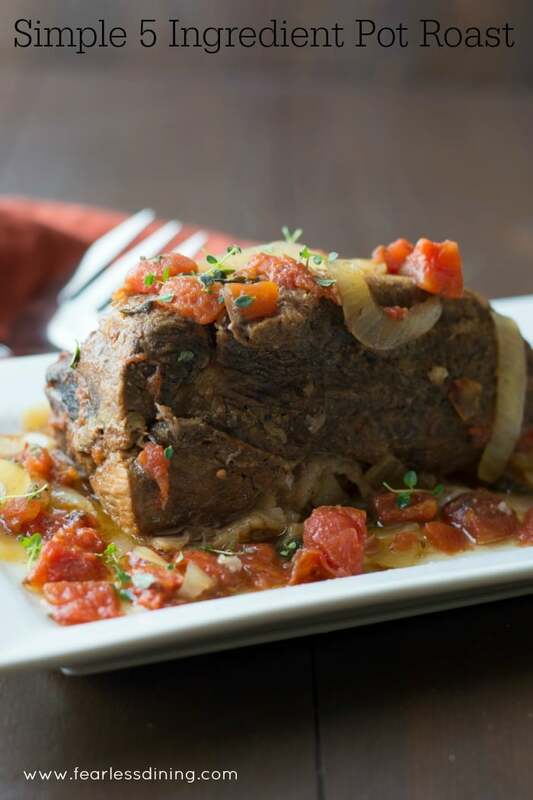 You can also use boneless beef chuck roast in this slow cooker pot roast recipe. We continue to get meat from our organic CSA Prather Ranch. (*please note this is an unsolicited plug. I was NOT compensated in any way to mention them.) Each month is a mystery. We never know what we get until we open up the box. This month, there was a two-pound roast included. My growing son was so excited about this roast. At 13 and 5’8″ he is growing like a weed, and eating us out of house and home in the process. Pot roast is typically braised and then slow cooked so it becomes tender, almost melting in your mouth. I am a bit lazy and so my roast recipe is not braised. As you can see below, I just dumped it all into my slow cooker. If you have a tough cut of meat, this is the best way to make it tender. 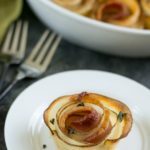 Even without the braising, my easy roast recipe made a delicious dinner our whole family devoured. This roast lasted about 12 hours. That is it. My son really, really loved this boneless chuck roast dinner and had several dinners within a few hours :-). Do you have boys? Do yours eat constantly? I am still amazed at how much food they can put away. As I mentioned before, this is a simple dump, cover, and cook pot roast slow cooker recipe. Visit here to see all of the dinner recipes on Fearless Dining. 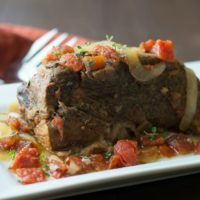 What size slow cooker is best for this pot roast recipe? This recipe calls for a 2-pound pot roast. This will fit in most slow cooker sizes. My crock pot is 6 quart sized. Can you use other vegetables? Slow Cooker. Load in all of the ingredients put on the lid and turn it on low. Dinner will be ready in 5-6 hours! Put all of the ingredients into a crock pot. Turn on high and cook for 4 hours. Reduce the heat to low and cook and additional 2 hours. Feel free to add vegetables to the crock pot. My kids are not fond of vegetables cooked in the slow cooker, but most kids probably aren't as picky as mine :-). Pot Roast is one of my favorite meals and this recipe sure hit the spot for dinner! Love that it’s just 5 ingredients! I like to keep things easy 🙂 I hope you like this pot roast as much as we did. thank you sandi I was looking for something like this to be done in @ least 4/5 hours. 5 ingredients? I’m in love! This looks like the perfect Monday night dinner when it’s still chilly out and I’m in need of something hearty and comforting! Love such easy to make recipes! Looks delicious! This Pot Roast looks utterly delicious! And EASY!!! Yay! I’m all about dump and go crock pot recipes. I am pinning this beauty for the next time I get hold of a gorgeous roast like you have there! I’m not good at cooking meat, but at eating I am. Your recipe looks fabulous! Thank you Del…you would be surprised how easy this is. MMmm pot roasts are the best! You’ve minded me we were given a pot roast cut from a local crofter that is still in the freezer. Local, home grown organic meat. Can’t beat it! I love that you have sourced a great source for organic meats. Holy moly that looks good. With a tossed green salad…I am THERE, for dinner! Perfect Sunday dinner and so good too! Gorgeous pot roast Sandi and a must-try for sure! Love the easy prep! One of my favorite comfort foods! 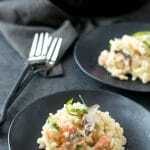 Great looking recipe!! 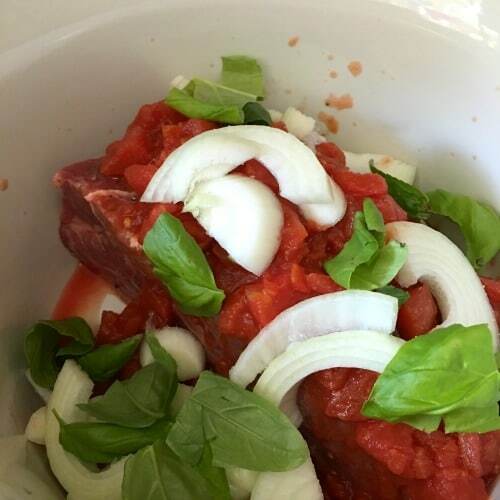 I love cooking in my slow cooker and this beef is right up my alley! My kiddoes are still small but I can image them growing up and eatingme out of house as they are both very very tall. And yes please to easy meals like this. Love simple meals like this. I typically make my pot roast with horseradish, but tomatoes sound great. Horseradish sounds wonderful in a roast recipe. Pot roast was always my favorite as a kid. 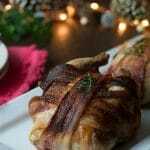 My mom would make it sometimes on Sundays, and I always loved that tender juicy meat! I do miss it now as a vegetarain, but this is exactly the kind of dish I like to make for company. Thanks for the recipe, I bookmarked it for later! Those childhood memories are wonderful. Thank you so much for your note. I love meat dishes like this one. Easy and yummy! I’m all about quick and easy also, your slow cooker pot roast sounds perfect. I can’t believe you don’t have to brown this roast for great flavor. This is a “time saver” for sure. Especially on a busy morning trying to get out the door. YUM. LOL I don’t have the patience for browning…I am all about easy. This pot roast looks fantastic! I’ve definitely fallen into the slump of using canned soup and powdered dressing mixes on my roasts…. I can just imagine how much better it would taste using fresh ingredients like this!